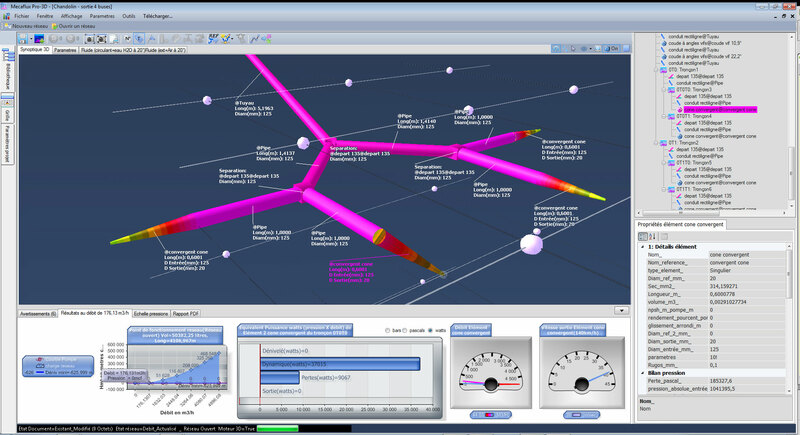 You can estimate the recoverable energy by a turbine instalation with Mecaflux software and design a Kaplan turbine type, propeller or tidal with Heliciel software. This type of turbine is particularly suitable for high head applications with variable flow, its efficiency is not very sensitive to the variation. 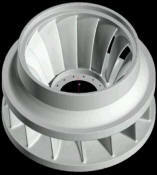 Small Pelton turbines can achieve mechanical efficiency (to the shaft) of 90%. Like Kaplan turbine, the Francis is a reaction machine. 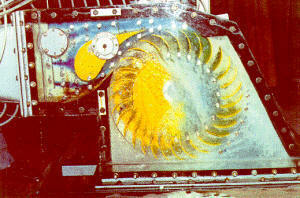 The wheel is immersed and operates both the water velocity (kinetic energy), that a pressure difference. 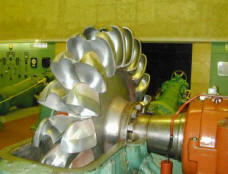 This type of turbine is located in the old low-head installations (less than10 m) where they are generally in water chamber, ie without scrollcase. Their speeds are very slow and their adaptability to changes in flow rate is relatively low, they were replaced by small Kaplan, entered the market in the years 1930-1940. 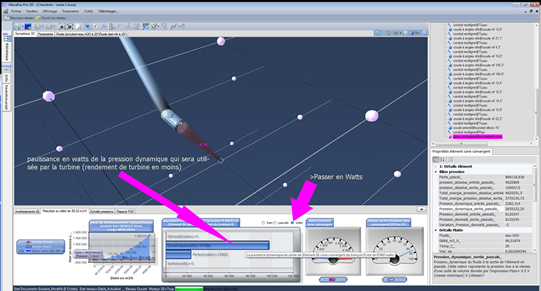 Currently, the field of use of Francis is ideally located between 20 et 100 m. For heads, above 60 m, they are preferred to Pelton when the flow is important. 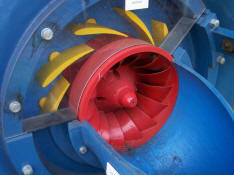 A turbine is chosen based on the flow rate and pressure available, the drop height with flow pressure range given above. 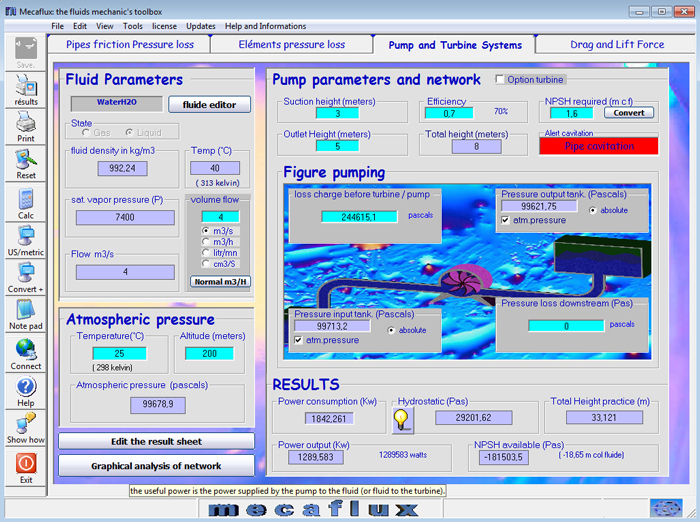 You can easily assess for relations between power, pressure, flow rate, drop height, pressure drop... with mecaflux in pumps and turbines tab. The losses in the penstock will be calculated and included in the evaluation of the deliverable power. The turbine efficiency should be entered according to the manufacturer datas. and the speed to at the outlet line (dynamic pressure). the gravity flow operation is established when: load losses + dynamic pressure is equal to the Vertical drop. .
A Pelton turbine collects the dynamic pressure energy at the outlet pipe. the dynamic pressure should therefore be maximum. It is necessary to avoid consuming of energy in head loss, and transform the maximum amount of energy, in dynamics pressure at the exit point. If the network creates speed in its ducts so that the speed should be outputted .... (diameter too small and lack of shrinking output.) The energy will be consumed in losses, it is necessary that the velocity of the fluid is as small as possible in the pipes. distribution losses (energy lost) <=> dynamic pressure (recoverable by the buckets of the turbine energy) is the heart of the problem. 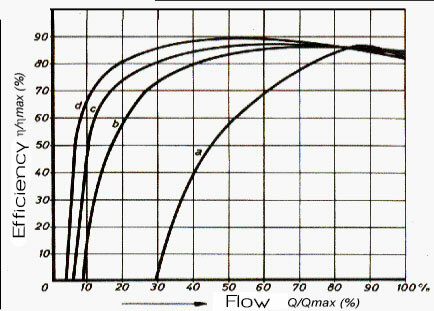 To have a good system requires a maximum dynamic pressure output for a minimum of head losses. 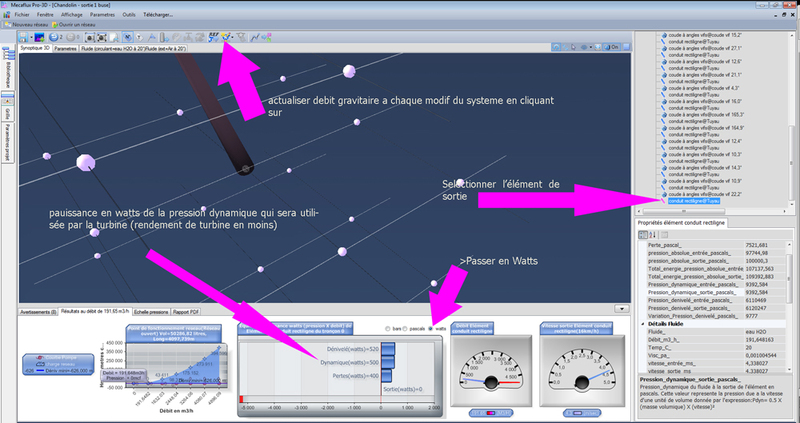 Pelton turbine configuration 2: In this configuration (below) nozzle was just added at pipe outlet: the dynamic pressure at the outlet rose to 97 Kw for a flow rate of 96 m3/h. 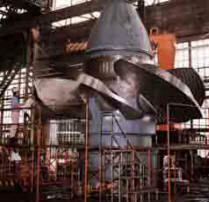 The Pelton turbine will receive an energy of 97 kWatts , loss of overall expenses are approximately (66 Kw) ,the gravity flow is small compared to the available flow (190 m3/h), It should increase the flow ..